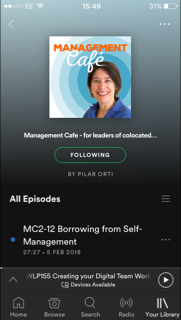 In today's episode, Pilar talks to Judy Rees about setting up the RSA Reinventing Work Network, Open Space events and using clean language with virtual teams. 00:40 Pilar's been busy over the last month, so there are quite a few updates here, lasting about 15 mins. The first webinar is on Communication in Virtual Teams. 10:30 - 14:45Say 'No' to Collaboration. How much time do YOU spend on collaborative activities? Pilar recommends 'Team of Teams'. 19:35 The history of the RSA Reinventing Work Network, a space for people who want to change the way in which organisations are structured. Judy and Pilar (well, mainly Judy, as she is the guest today) talk about what has happened so far in the network. Everyone has a piece of the puzzle, it's your job to find the others. 32:45How does an open space work? Judy talks us through the format we're using in the next meeting. Lean coffee - open space online. 'Blended' networks - taking the face to face discussion online to deepen conversations and strengthen the network. 42:25How Judy helps virtual teams to communicate better - by helping them get to know each other better! Team building in virtual teams. Clean language and the use of metaphor. How aware are you of the metaphors you use? The first step is to understand each other - what do we do next? Getting to know others helps you to get to know yourself.